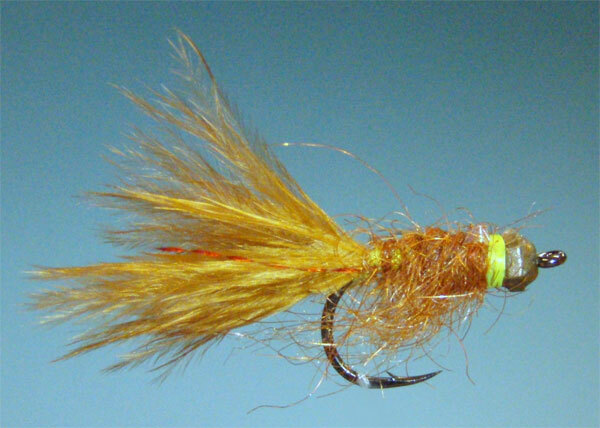 A yellowfish variation of the woolly bugger. 1) Thread bead onto hook and dress the hook shank with thread to above the barb. 2) Cut a bunch of filoplume from the base of a hen hackle. Tie this in above the barb using the pinch method. 3) Tie in one strand of flash either side of tail as well as the copper wire for rib if desired. 4) Form a dubbing noodle at the tail tie in point and wrap forward 2/3 along hook shank forming the body. 5) At this point tie in the flash for the wing case on top of the hook. 6) Carry on dubbing in front of the flash right up to the bead. 7) Pull the flash over the top forming the wing case and tie off behind the bead. 8) Keep wrapping the chartreuse thread behind the bead forming a neat chartreuse band behind the bead. 9)Whip finish and apply a small amount of head cement. 10) This fly is very effective for Natal Scalies especially when the water is not clear and can be tied in browns and greens.